Hunting deer isn’t easy, and all over the U.S. whitetail deer hunters face challenges unique to their region. And that’s the way it should be; if this were simple it would be no fun and without the challenge this pursuit wouldn’t be so addicting. I believe there are two primary challenges to hunting deer here in the northeast. The first is hunting pressure. New England is a small geographic area that is maturely developed, and thus there is a small amount of deer habitat and it sees high hunter densities. The second challenge is lack of land to hunt near agriculture and predictable deer feeding areas. Generally speaking, we’re hunting hardwood forest areas where it’s difficult to pattern and predict deer activity. Over the last few weeks the sunset has been getting later and I’m now commuting home from work while it’s still daylight. Several times now I have witnessed deer feeding in the small field located just above the property outline in this photo. After doing some research and asking a few questions I’ve secured the ability to hunt the property outlined in orange. This discovery has me pretty excited. This wooded parcel should be a good travel corridor and staging area that the deer will use on their way to and from that field. Soon I will walk the property to begin learning what’s going on and I’ll get a trail camera in there to begin surveying the deer activity. 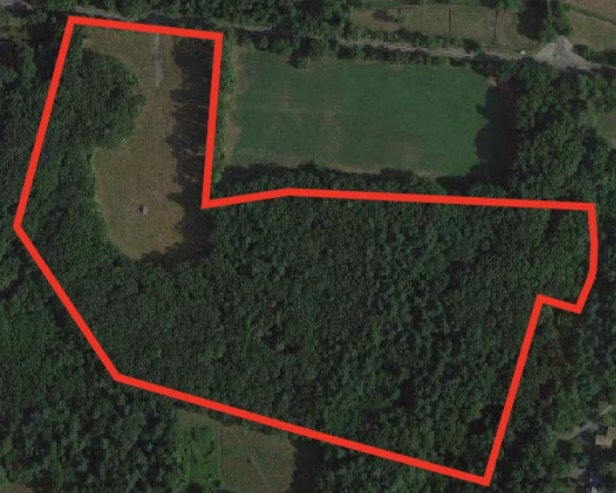 The biggest question on this property will be the answer to challenge #1…hunter density. I hope I don’t get in there only to find signs that other hunters are already all over it. If I do, it certainly won’t come as a surprise! I wish you the best of luck. May there be a power density of hunters and a higher density of big bucks! Thanks Mike, I’m hoping for the same!